I'm a bit of an old soul. Even though I see the appeal of Kindle and e-books, to me there's nothing quite like the touch and smell of a real book. So when it came to our wedding invites, I always knew ours would be hand-made. After a lot of thought and some prototypes, this is what our wedding guests received in their mail box or in person. 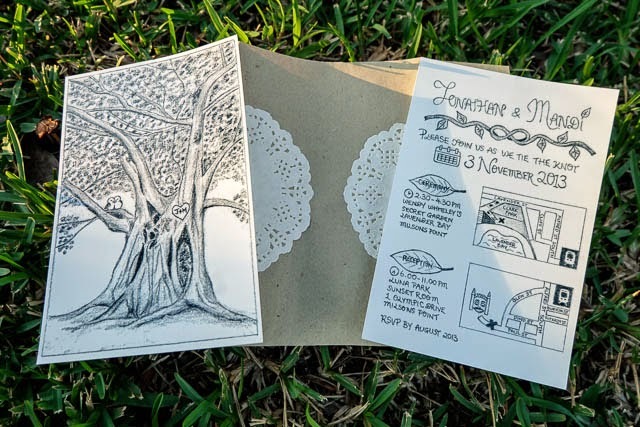 I started with two A5-sized pencil drawings - a cover page and an invite page (that included details of our wedding and a map of the venues). This turned out to be the easy part! 3. use Giclée printing to reproduce multiple copies of the original drawings. I would have loved to use Giclée printing because in terms of quality, it is the best technique for reproducing original artworks. The cost of Giclée printing is reasonable in large quantities, but because we only needed a relatively small number of invites, that option was too expensive so we went with option number 2. Step 8: Wrap the twine around the invite cover, tighten and tie it into a bow, and trim the ends of the twine to finish. It is a Chinese tradition for wedding guests to give a monetary gift in a special red envelope to the bride and groom (also known as a "red pocket") so we included this with a brief explanation in each of our invites. Even if you are not Chinese, you can still include a short message in your invites asking your guests to contribute to your honeymoon or a wishing well. That will save your guests from stressing out about what to buy for a wedding gift! I had a lot of fun designing and making our wedding invites, and I'm sure you will too if you decide to take on this DIY project. If you have had a go at following our pictorial, please leave a comment and I would love to see your work.